Doesn't seem to be much selection of engine performance goodies for a Frontier, Eh? At least that I've found, anyways....Yeah, a K&N or Volant CAI, a few exhaust system options, maybe an IMS....and I'm sure I can find a shop that'll tune the ECU for me....Am I looking in the wrong places? Might want to get in touch with Holden Scott. His family owns Regal Nissan and is a host in the”Nissan Nation Podcast”. 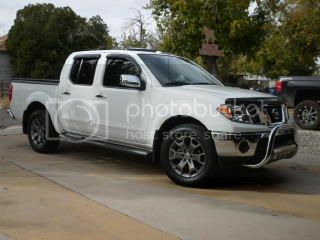 Did some trick things to his Frontier, including GTR injectors , Uprev. Heard he is very accomadate . Try e-mailing him at Regal Nissan. There isnt much unfortunately. My biggest sadness is stillen no longer makes the supercharger. I think 2012 was it. people who buy the cheapest truck made aren't usually in the market to spend thousands more to make power, they bought a frontier to save cash not blow cash.it's like tryin to find a performance company that makes parts for a vespa scooter, it dont exist cause theres no market. Not our Fault the cheapest midsize truck, happens to be the best. It is just not as popular as others. the frontier has a pretty capable aftermarket following, I certainly have never been at a loss finding replacement or aftermarket parts for my truck. What are you looking for... have a look at the newX thread. It's because these 4.0L trucks are so quick and powerful right off the showroom floor …..
76DatsunZ and 76DatsunZ like this. it's like tryin to find a performance company that makes parts for a vespa scooter, it dont exist cause theres no market. I guess my advice is perhaps you bought the wrong vehicle in the first place... The Frontier has an awesome 4.0 engine with 261 HP and gobs of torque, for doing what a truck is supposed to do, Hauling, towing and the like. On the flip side it is a heavy vehicle not really designed to be souped up much. Either trade for a lighter, faster vehicle or do the Titan V8 swap. My two cents.